Since Christmas did not become a national holiday until 1870 during the administration of Ulysses S. Grant, it is not surprising that the exchanging of White House Christmas cards was not a yearly presidential custom during the very early history of our country. For most of our earlier presidents, there is very little documented information regarding Christmas celebrations or traditions they or their families may have practiced. However, whether it is because he was a prolific letter-writer or that scholars have accumulated a wealth of information on his life from painstaking research, there is more information describing Christmas celebrations of our third president, Thomas Jefferson, than any of our other Founding Fathers who became president. This information reflects both the time Jefferson spent as president in the White House and at his famous Virginia home, Monticello. Thomas Jefferson was born on April 13, 1743 to Peter and Jane Randolph Jefferson. Young Thomas began his schooling at the age of nine, studying French, Latin and Greek. Several years later, he took up science and history as part of his classical education. The family lived in Albemarle County, Virginia until the death of Peter Jefferson, when the family moved to a new home, which later became famous as Monticello. Even though in the mid-18th Century Christmas was considered a normal workday, Jefferson always considered the day (even in his youth) as a time of “merriment” and “The day of greatest mirth and jollity.” Monticello became known as a place where friends and family got together to celebrate Christmas and where Jefferson would feel happy enjoying his favorite Christmas song, “Adeste Fideles” (“Oh. Come All Ye Faithful”). Jefferson courted and then married Martha Wayles Jefferson, a widow, a week after Christmas on New Year’s Day in 1772. Although they had six children (five daughters and a son), only the daughters Maria and Martha lived past early childhood. After only 10 years of marriage, Jefferson became a widower following the death of his wife, most probably from complications giving birth to daughter, Lucy (who died two years after her mother). By the time Jefferson became president almost 20 years later, he would have spent Christmas in a forlorn and lonesome mood had it not been for the joyous visits from his grandchildren. Although he was a slave owner, Jefferson’s abolitionist leanings ensured that those slaves he owned were treated fairly, as is evidenced by the slaves being allowed to have a Christmas holiday respite for a few days each year. With normal, everyday responsibilities set aside, slaves could travel to and from the Jefferson mansion to visit friends and relatives. For those staying at Monticello for the holiday, slaves were able to enjoy fresh meat instead of the usual cornmeal and pork. Music added to the gaiety of the holiday as well. 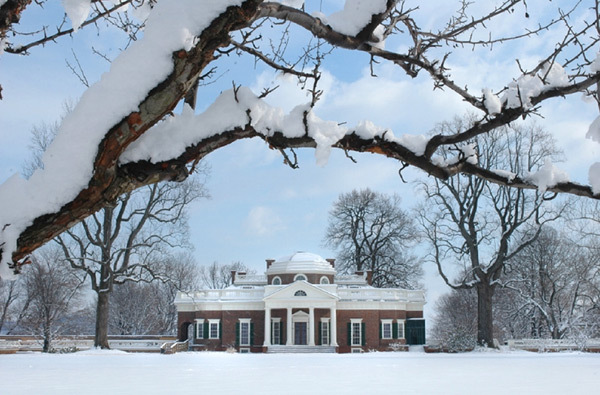 Monticello, Thomas Jefferson’s estate and plantation located in Charlottesville, Virginia, where he hosted many lavish Christmas celebrations before and after his presidency. It has long been believed by many historians (and disbelieved by many as well) that one of Jefferson’s slaves, Sally Hemings, who for many years served his daughters and his family in various capacities, bore six children who were fathered by Jefferson, himself. Although there is no direct proof, we can only speculate as to how many of these children were included in the Christmas celebrations at either the White House or Monticello. Had the Jefferson family acknowledged the Jefferson/Hemings union from its inception and had the relationship amongst all those involved been one of family and closeness, imagine the size of their Christmas get-togethers and all the Christmas cards that would most certainly have been exchanged between the families for all the years since! Thomas Jefferson received his education at the College of William and Mary for a two-year period beginning in 1760. He graduated with highest honors after studying philosophy, mathematics, and metaphysics, as well as French and Greek. His curiosity in many areas knew no bounds, as he also showed an interest in the readings of Tacitus and Homer and did his best to become proficient in playing the violin, all this while oftentimes studying 15 hours a day. After graduating with highest honors from William and Mary, Jefferson became a lawyer after being admitted to the Virginia bar in 1767. 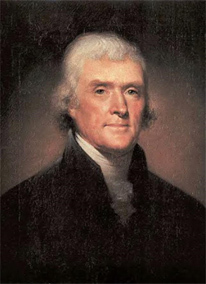 Thomas Jefferson was an “idea man.” While practicing law and serving in the Virginia House of Burgesses, he wrote his first published work, A Summary View of the Rights of British America, which proposed that the British Parliament had no authority over the colonists, who should be allowed to govern themselves. These radical thoughts provided the theoretical basis for what became one of Jefferson’s greatest accomplishments, as the writer of the Declaration of Independence, the wording of which was approved by the new United States Congress on July 4, 1776. Had the exchanging of Christmas cards been the custom around that time, most of the 56 signers of the document would undoubtedly have relayed written Christmas wishes to each other later that year, as would have been the certainty that there would not have been any Christmas greetings between England’s tyrant, King George III, and the independence-minded signers of the Declaration! After the end of his term as Secretary of State and after spending several years at his Virginia home, Jefferson ran for the presidency against John Adams, but lost. However, because he came in second in the electoral vote count, he became Adams’ vice president. Four years later, however, Jefferson and Democratic-Republican Party member, Aaron Burr, each obtained the same amount of electoral votes in the presidential election; Jefferson, after 36 ballots, was voted in by the House of Representatives, with Burr to serve as his vice president. Considered one of our greatest presidents, Jefferson’s accomplishments during his two terms included the purchase of the Louisiana territory from France, doubling the size of the United States; Lewis and Clark’s western expeditions (which took the explorers away from their families through two Christmases), exploring the just-obtained Louisiana territory all the way to the Pacific Ocean; and the winning of the First Barbary War, the country’s first major overseas war victory. Based on his nature, it is not surprising that Jefferson remained active after he left the presidency in 1809. His main achievement was the founding of the University of Virginia in 1819, something he had been planning for several decades. His realization for the school was based on the idea that it would be a place where students could study subjects different from what was being taught in other universities at a price affordable for almost anyone. Using his architectural skills, Jefferson has been credited with the designing of all the buildings, gardens, and grounds as well as the layout of the entire campus. I’ve always been fascinated by the relationship between Jefferson & his “frenemy” Adams. These two historical giants battled each other politically and then retained a friendship based on mutual respect for decades, finally passing away on the very same Fourth of July. I always found it interesting the relationship that Jefferson had with Sally Hemings. I wonder if he was indeed the father of her 6 children, if he was active in their lives to any degree. I am fascinated by Presidential history. It is interesting to see how politics and politicians evolve over time. I wonder how Thomas Jefferson’s views and opinions would hold up in today’s society. I am sure that those on the right would castigate Tom Jefferson not only because he stood for the people but his allegedly fathering 6 children with one of his slaves would undoubtedly get him impeached in this day and age. But like many, he would probably make appearances on all the late-night talk shows which would definitely erase his bad reputation since he is such an interesting individual. Messages from Thomas Jefferson < Loved it!